Around 1500 B.C, the Strongili volcano, as the original island was called, erupted with catastrophic but incredible results. The Stroggili island disappeared and today’s remaining island, Thera, is composed of the earth and lava that were pushed up, from inside the earth. At the time of the eruption, a thriving community existed on Strongili (the Round). It is not sure whether the population was linked to the Minoan settlers in Crete. 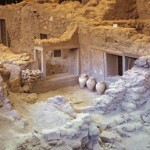 There have so far been no human remains discovered from the history of Santorini, archeological site in Akrotiri. Which leads everybody to believe, the islanders had warning that something big and devastating was about to happen thus giving them time to leave the island. Streets, squares and houses have been uncovered showing a pipe system suggesting the population had hot and cold running water. The hot water probably coming from a source close to a magma stream. The many frescos, which have been uncovered, also suggest that these people were not of the Minoan race the frescos depict an entirely different culture. The volcano spewed over 30 cubic kilometers of magma, rock and volcanic ash into the atmosphere burying the remains of Strongili. Beneath the volcano, where the magma had been stored, there was a huge chamber. The volcano collapsed into this chamber covering it with tons of ocean. The resulting caldera is the biggest in the world. The volcano continued erupting its magma into the sea, a new landmass formed from this cooling magma, which can be seen in the middle of the caldera Nea Kameni (young Burnt). The Tsunami, which followed, must have had devastating results to neighboring islands. It is believed the Tsunami reached the island of Crete. A devastating blow to the population of Minonians living on the island. Was this the end of Atlantis? Was the myth of Atlantis in a way connected to Strongili? 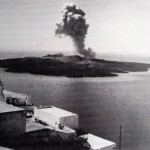 Was Santorini Atlantis? Atlantis was buried beneath lava, ash, and pumice in the Minoan eruption. 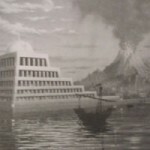 After the lava hardened, the modern-day civilization was built. In the same way, after 2,000 years, the island of Santorini cooled, vegetation started taking root birds found nesting places, and the island populated again. The first settlers needed shelter which they constructed, by digging into the soft volcanic pumice stone, to make their small dwellings. This activity still goes on today. Some islanders dig storerooms for fishing nets and workshops to repair their boats.